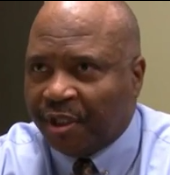 "I was so impressed with the book I actually called Chris Davis’ office"
Reggie is a former police officer and auto insurance claims adjuster who just happened to stumble upon a copy of attorney Chris Davis's book, "The Ten Biggest Mistakes That Can Wreck Your Washington Accident Case." Because both of his previous careers had given him a great deal of insight into the complex nature of car accident claims and personal injury law, Reggie decided to read Mr. Davis's book 'cover to cover.' As it turns out, Reggie found the book to be very useful, packed with practical information that explained the process in layman's terms. Hello my name is Reggie and I spent the last 10 years as an auto claim represent and prior to that I was a police officer. 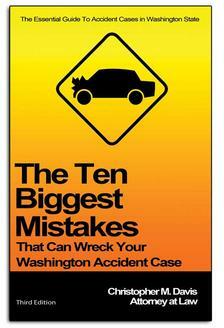 One day I happen to be in a Starbucks getting a coffee and I sat down at a vacant table and when I sat at the table there was this book laying there, The 10 Biggest Mistakes That Can Wreck Your Washington Accident Case. When I looked at the title I thought it was quiet inviting based on my prior experiences in the automobile insurance industry and also in law enforcement. So I sat there in fascination and read this book cover to cover. I was very impressed with the content. I found that it had a lot of information in it which was both timely, practical and also unbiased as it relates to how to handle an accident case if you were involved in one. I was so impressed with the book I actually called Chris Davis’ office and shared with them my experiences both a police officer as well as a claims adjuster. I would strongly suggest anyone who has been involved in a motor vehicle accident where they have incurred either personal bodily injury and or property damage or if they have not been a victim of an automobile accident to read this. I think it something that should be a main state with someone that owns an automobile and operates it on the highways of this country. "...they start to go to bat for you immediately." -S.P. "...answers to our questions are always clear, complete, and demonstrate a sophisticated knowledge of the case and the intricacies involved." -Mark D.
"I couldn't have asked for anything better" -Ron T.